Building spice tolerance is key to unlocking fresh new flavors in various cuisines and becoming competitive in food consumption competitions. Inevitably, meals will be encountered that exceed spice tolerance and debilitating pain then ensues. This pain is caused by Capsaicin, a small molecule found in peppers. When capsaicin binds a receptor (TRPV1 – the same that recognizes chemical, acid and fire burns) signals to the brain are sent and thus pain. The purpose of this experiment will be to look for ways to disrupt the signal and answer the question of whether the power of knowledge and science can overcome the disasterous scotch bonnet pepper. Scientific AmeriKen will attempt several strategies to overcome the hot pepper. As milk is a popular antidote to spice it will be one of the first strategies attempted. Milk is believed to work as a detergent that washes the capsaicin away from the pain receptor. Capsaicin is a hydrophobic compound (one that behaves more like oil than water) – which may be why water is typically uneffective at easing the pain. To enhance the hydrophobic quality of milk a second strategy will involve creating a 50/50 mixture of milk and olive oil. Finally, a third strategy will be to attempt to modify the pain receptor. A protein called miraculin, found in miracle fruit, is known to bind taste bud receptors and change the way foods taste for up to an hour after exposure. An example of its effect is making a lemon taste sweet. Scientific AmeriKen will explore the ability of miraculin to modify the TRPV1 receptor and nullify the burning sensation. The pepper of choice in this experiment is the scotch bonnet. The scotch bonnet has a scoville rating of between 100,000-300,000. This is equivalent to the habenero pepper - for reference a Jalepeno pepper is rated at about 8,000 scoville units while pepper spray is 1,500,000. 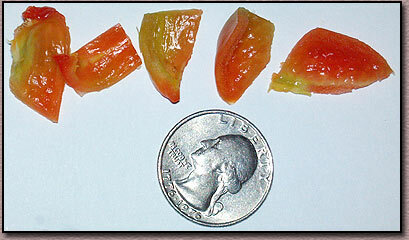 Pieces of the pepper were cut to a size slightly smaller than a US quarter (picture below). Standard procedure in this experiment was to place the piece of pepper in mouth, chew for 15 seconds at which time the pepper could be swallowed and any experimental aid can be used as needed. Whole milk was used in this experiment. For the milk/olive oil trial, equal parts of each were added and whipped with a fork until frothy. For the miraculin trial, miracle fruit tabs were purchased and used according to manufacturer’s recommendations. Trials were timed and heat intensity was noted at varying time points. A minimum of 15 minutes between trials was used to avoid any desensitization. To set a baseline, a piece of scotch bonnet pepper was chewed for 15 seconds and swallowed and intensity of pain was tracked (figure below – black line). Pain seemed to peak after roughly 30-40 seconds (arbitrarily marked at 100%) and pain intensity stayed relatively high for a few minutes before completely dissipating after roughly 5 minutes. Milk has traditionally been considered a curative agent against spicy food. Next Scientific AmeriKen put this to the test starting with drinking of whole milk following 15 seconds of chewing the pepper (green line). It was noted that milk had an alleviating effect as it was being imbibed, however, pain would quickly return with high level intensity. Additionally, the milk made the saliva very viscous which would trap the capsaicins causing further burning. Two minutes into the experiment milk washes were quickly followed by water to improve effectiveness. Overall, pain dissipated after 5 minutes although overall intensity remained higher than the pepper alone. Surprisingly, a 50/50 mixture of olive oil and milk was very effective and reducing pain (red line). Following drinking of the mixture, pain was reduced >70% after roughly 40 seconds from consumption of the pepper. Total pain dissipated after about 2-3 minutes. Finally, the effectiveness of Miraculin was tested. Before the pepper test, miraculin’s effect on the taste receptors was confirmed by the consumption of pure lemon. The taste of the lemon was indeed sugary sweet and the effect on the intensity of the pepper was then tested (blue line). Despite miraculin’s ability to change the flavor of lemons - there was no miracle relief of pepper pain. There were two key findings from this experiment. The first was the near ineffectiveness of the classic standby milk. Milk has long been believed to be the cure to spice, however, our observations show milk not only did not decrease total time of pain but in fact exacerbated the intensity of pain. We believe this misconception about the helpful benefits of milk come from the temporary relief that happens as the milk is being consumed. Despite the ineffectiveness of 100% milk, a 50/50 mixture of milk and olive oil was very effective. Scientific AmeriKen believes this combination is effective due to the oil working to dissolve the capsaicin away from the receptors and the milk working to emulsify the oil allowing it to mix with saliva allowing for easier swallowing and removal of the capsaicin. Although miraculin was very enjoyable it was not effective at alleving pepper pain. This result was not entirely unexpected as miraculin is believed to bind to sour taste receptors while capsaicin binds to the TRPV (vanilloid) receptor. This receptor is activated by burns, whether it is chemical (capsaicin), heat (above 47 oC) or acid. The initial design of this experiment called for strategies aimed to desensitize this receptor through drinking hot beverages, using long exposure to diluted cayenne pepper or soaking the tongue in lemon juice. Unfortunately, consumption during these experiments of all the milk, peppers and oil caused fullness leaving no more room in the stomach for further testing. However, as this was the most difficult experiment in Scientific AmeriKen history, further experimentation in this area is unlikely. As a final note Scientific AmeriKen cautions that extreme care should be taken when performing experiments such as this. During this experiment, a runny nose led to a transfer of capsaicins from the hands to inside the nose. Although the life changing pain is not believed to have influenced the results describe here it does illustrate the dangers of performing this experiment. Care should be taken in handling peppers and choosing peppers of the right tolerance level for the experimenter.